Sallyanne Haigh is a 43 year old mother of two children - Harry 15 and Stella 13. She is a local community nurse manager working at Frome Valley Medical Centre. 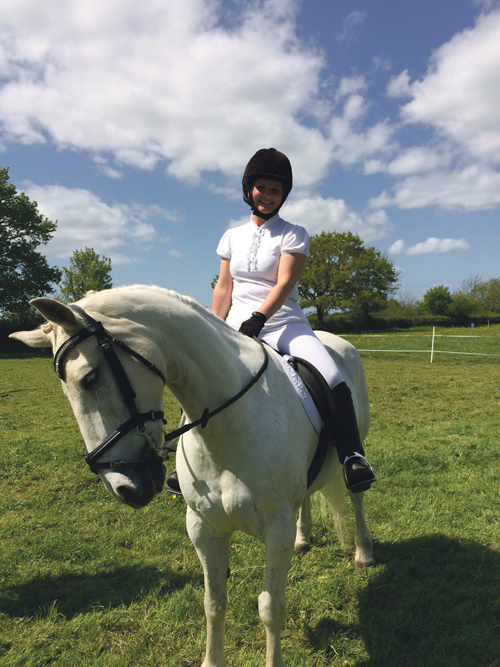 Just over a year ago her life was changed forever after a riding accident in Chipping Sodbury that has left her paralysed. But as she explains in this article for The Voice, she is determined to pursue her dreams. On the 10th October 2015 my life changed forever. I was riding my horse at a local Severn Vale Riding Club event at Hollister’s in Chipping Sodbury when the unthinkable happen. We approached a Cross-country fence and didn’t get it quite right, resulting in the horse I was riding rearing up and going over backwards on top of me and crushing me. Thank goodness for the Great Weston Air Ambulance team, who after the initial assessment airlifted me to Southmead hospital, where I underwent a 9 hour emergency operation to fix my broken vertebra, but I had been left with irreparable spinal cord damage. I spent the next 3 months in Southmead Hospital and a further 3 months in the Salisbury spinal unit. I had to learn to live life in a wheelchair paralysed from the waist down. These injuries are complicated and let’s just say after being a nurse for 22 years; I did not make a good patient. I have been home now 10 months and through the support from family, special friends, grit and determination I am independently living back at home with my children. This is an amazing achievement. As soon as I was able to think clearly after my accident I decided I wanted to ride again. This isn’t as easy as it sounds when you can’t sit up. I am working towards getting back on top and riding for the British para dressage team. With the help from my personal trainer Seona Bleakman from Frampton Fitness, we are working at strengthening my core and balance. I have sponsorship from Pearce Brothers Mobility in Yate. James and the team at Pearce Brothers have been amazing in providing me with essential equipment to assist with everyday living, and without their support and equipment life would be much more difficult for me, even impossible. Pearce Brothers are helping to fund the hoist to be fitted onto the back of the horse lorry which will get me back up on top and able to attend competitions. My trainer Beth Hobbs from Loan Oak Stables has sponsored a horse for me to ride and compete on (which is the best bit so far). We have been offered a monthly Blog by Your Horse magazine, as they want to follow my journey and I have started a blog about my antics and this can be followed at myparajourney.blogspot.co.uk. I have attended 2 Para training days on the ground, and am going to Hartpury Equine Therapy Centre on a fit-to-ride British Para training day. This is really exciting and such an opportunity for me. I am looking for local sponsors to support me through the provision of products, services or finances to assist in achieving my goal of one day riding at the Paralympics.